Tim Poole, Manitoba Important Bird Area Program Coordinator, describes the final day of the Southwestern Mixed-grass Prairie IBA weekend. So thanks Marshall for the fantastic trip reports from days 1-3 of our southwestern odyssey. After our 2nd Chicken Chef of the trip, Garry, Bonnie, Ken and Marshall departed on long journeys. This left Christian and me in the company of Colin and Karla for the remainder of the day. At this point I managed to introduce the others to a favourite pastime of mine – driving aimlessly around small towns looking for something. We were searching for the Antler River Historical Society Museum having been given reports of Chimney Swifts entering the chimney. Originally I intended to go in the evening but by this point, tiredness had caught up with everyone and I decided just to take a look instead. Returning to Tilston, it was time to take a rest. Downtime is also a great excuse to explore and I took a walk through the town. Tilston has an interesting history. Apparently it was once a bustling town with a station on the Canadian Pacific Railway. The town is now much smaller than at its peak, the school has been abandoned (http://www.mhs.mb.ca/docs/sites/tilstonschool.shtml) and derelict houses have been demolished. The large grain elevators and other farm buildings are still a sign that this is old arable country which contrasted a bit to the prairie pastures further east and south. The storm clouds were gathering over Saskatchewan and North Dakota by mid-afternoon and heading our way. There remained a fair few birds around including Say’s Phoebe, Sora, Western Meadowlark, blackbirds and various waterfowl. Soon after the rumbles of thunder and flashes of lightning were over us and it was time to retire to a dry building. The combination of storm, tiredness and the fact we had seen pretty much everything there was to see meant that we avoided any further birdwatching that night. The following morning Christian and I set off early for a visit to Whitewater Lake IBA. This was my first visit to this site apart from during the depths of winter and I was excited by the prospect of seeing some of its rich birdlife and getting to find out a bit more about one of Manitoba’ best known IBA’s. It had been mentioned by various people that Whitewater Lake had expanded somewhat since the original IBA boundary had been determined. 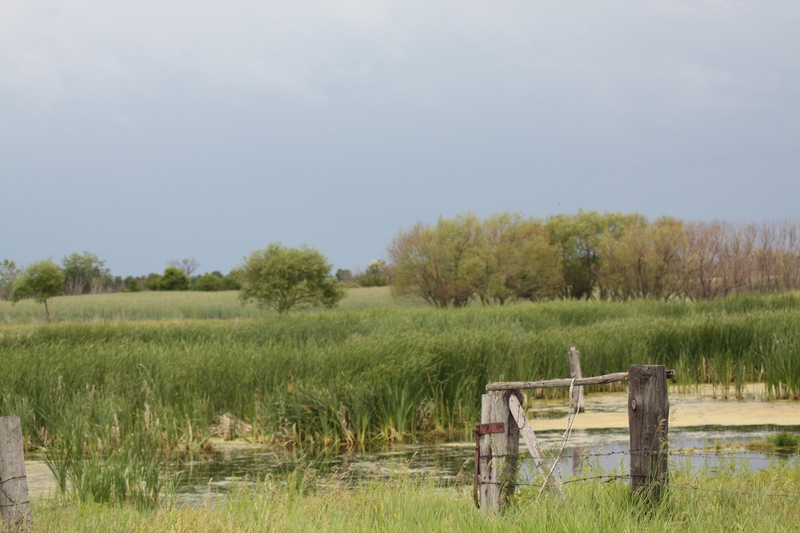 It is well known that we are currently experiencing a period of high water levels across Manitoba, maybe not quite the resurgence of Lake Agassiz, but still, enough to significantly alter habitats over a wide landscape. 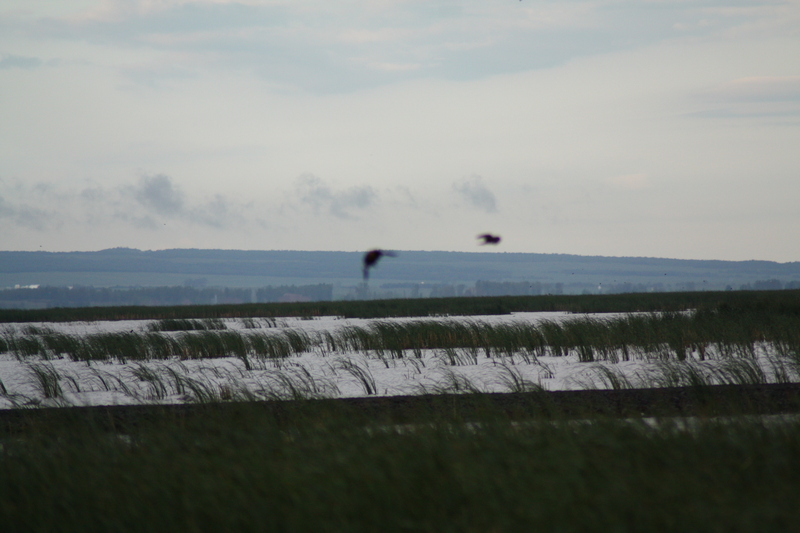 The area outside the IBA is currently very important for birdlife, with large bodies of temporary water, small wetlands, muddy scrapes for shorebirds and temporary pools in the middle of agricultural fields in abundance. There were also a number of Ducks Unlimited signs highlighting Conservation Easements and Wetland Restoration Projects. It was pretty obvious that the last few years must have hit local farmers hard, with entire arable fields now under water or covered in cattails rather than arable crops. It’s amazing to see how quickly nature will re-establish itself when the opportunity presents itself. Unfortunately at this point I should say that I doubt we managed to get as far as entering the IBA itself. The main viewing mound to the south is now inaccessible and the roads were too tricky on the day due to the heavy overnight rainfall, to enter on either the north or west. Ironically from a birding point of view, this would not matter so much but from the point of view of our Caretakers Colin and Gillian, this must be frustrating. The area as I previously mentioned was teeming with birdlife. 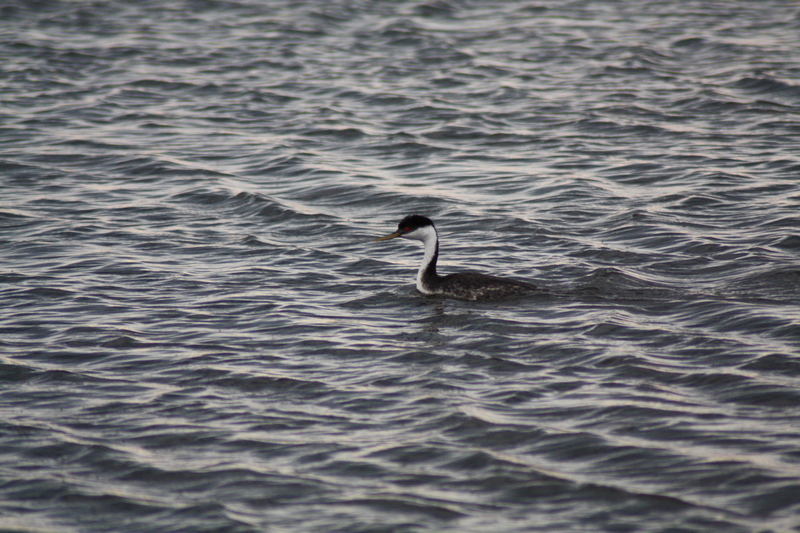 The highlights for me, still so new to Canada, were 2 lifers. 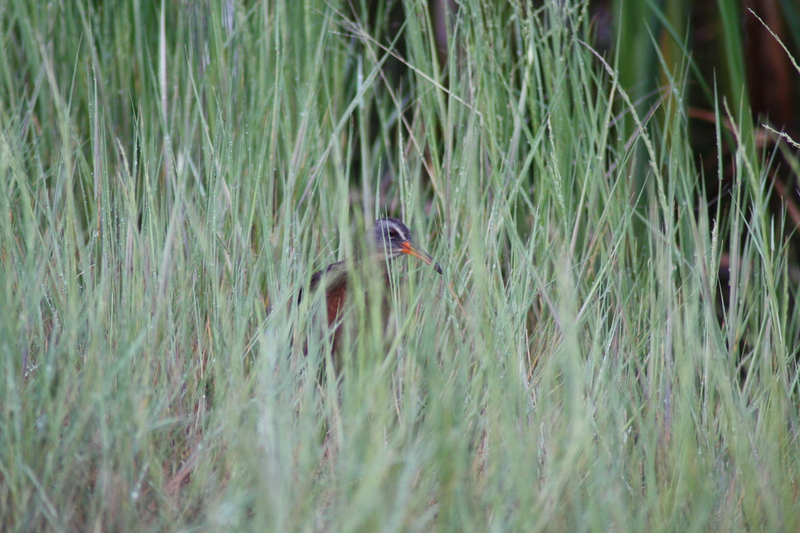 The first being the White-faced Ibis. 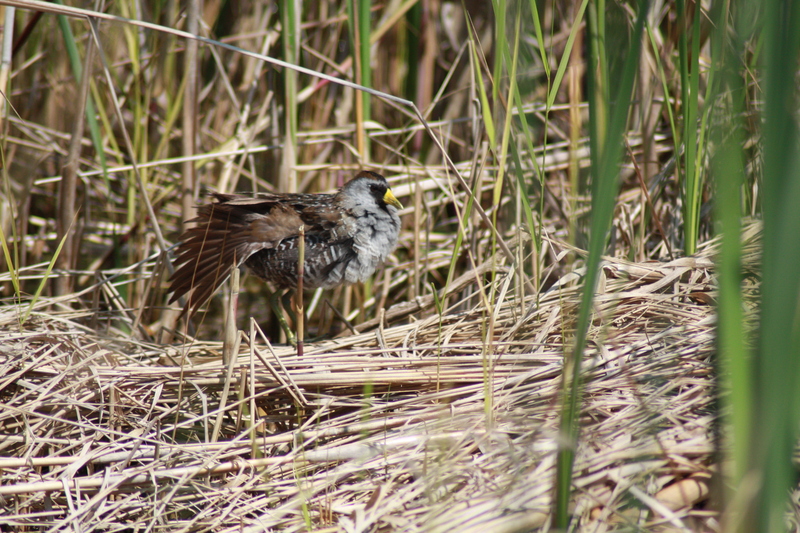 These colonial nesting birds are relative newcomers to Manitoba having only begun to appear as the water levels began increasing during the last 10 years. My 2nd lifer was a California Gull which is a rare breeder but more common visitor to Manitoba. Other species of interest included cracking views of a Virginia Rail, a pair of Upland Sandpipers, Great White Egret, American Bittern, Great Blue Heron, Ring-necked Duck, Swainson’s Hawk, Sora, 4 species of grebe, Willet, Avocet, Marbled Godwit, Wilson’s Phalarope, Brown Thrasher. In total 71 species in just a short visit and a great introduction for me for this IBA. It did occur to both of us though that we might need to look at that IBA boundary again at some point. We left Whitewater and headed north towards Highway 1. We took a quick detour to look for the Field Sparrow north of Souris and secured my 3rd lifer of the day in the process. 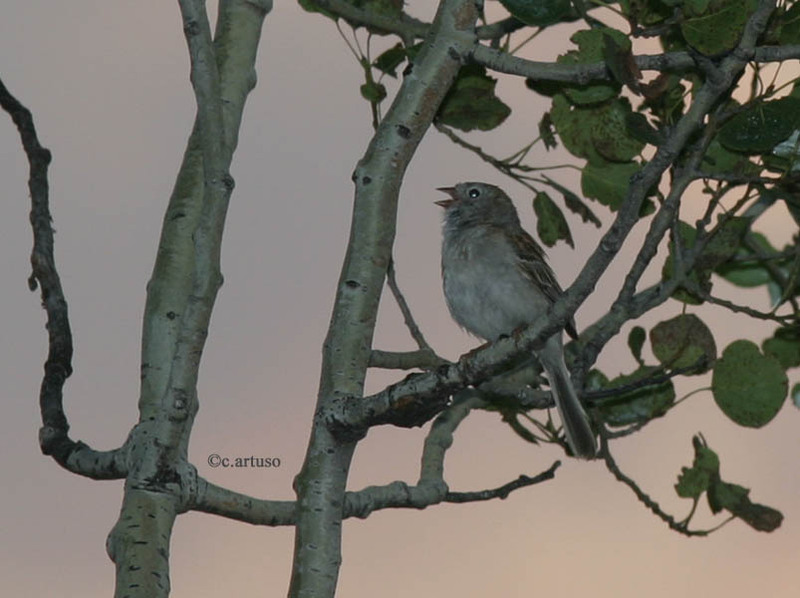 Field Sparrows are another vagrant which usually breed in the eastern USA as far north as southern areas of Minnesota and North Dakota. This particular bird has been in this spot the last couple of years so he obviously likes it! We also had great views of Lark Sparrow and a further 30 species. Back on the road and heading for home via the Sioux Valley to look for Yellow-breasted Chat, another Manitoba rarity. This time, for the first time all weekend we were unsuccessful. It was pretty windy and we wondered if on a better day we might have heard it. Since then Garry Budyk and John Weier managed to hear one in that spot, so obviously we missed out! Then it really was heading home. At this point I wanted to thank everyone for making this weekend a success, landowners, volunteers, Christian (driver and birdwatcher extraordinaire), Bonnie, Garry, Colin, Karla, Ken, Marshall, Alex, Colin and Gillian. Carrying out single day IBA blitzes to census bird populations is likely to be an important tool to increase the area covered and accuracy of our IBA monitoring. Watch this space for more news on this front in the future.